Dr. Ofori-Acquah has a research interest in molecular hematology, endothelial barrier function, sickle cell disease (SCD) and global health. His basic science research is on mechanisms of neutralizing erythroid danger associated molecular pattern (eDAMP) molecules. This work encompasses studies of developmental, genetic and epigenetic regulation of hemopexin and heme oxygenase-1, the key neutralizing molecules of extracellular heme the prototypical eDAMP. His basic research is translated to understanding the role and mechanism of extracellular heme in the pathobiology of vascular complications in SCD. A major translational focus is acute chest syndrome, the leading cause of premature death in SCD. The Ofori-Acquah lab developed the first mouse model of acute chest syndrome. This preclinical model is currently being used to find targeted therapies for acute chest syndrome. His global health research is centered on a longitudinal observational study of a large newborn cohort in Ghana to define markers of end-organ damage in SCD. Additional global health work focused also on SCD is performed under the auspices of the H3Africa consortium with a multi-disciplinary team of collaborators in Cameroon, Tanzania and South Africa. 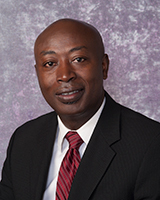 Dr. Ofori-Acquah directs a research education NIH funded R25 program aimed at catalyzing the training of graduates, postdocs and junior faculty in blood science research. He is Visiting Professor and Director of a Human Genetics graduate course in a Wellcome Trust funded DELTAS (Developing Excellence in Leadership, Training and Science) program at the University of Ghana in collaboration with the Pitt Graduate School of Public Health. Benneh-Akwasi Kuma A, Owusu-Ansah AT, Ampoma MA, Sey F, Olayemi E, Nouraie M, Ofori-Acquah SF. Prevalence of relative systemic hypertension in adults with sickle cell disease in Ghana. PLoS One. 2018; 13(1): e0190347. Ghosh S, Hazra R, Ihunnah CA, Weidert F, Flage B, ofori-Acquah SF. Augmented NRF2 activation protects adult sickle mice from lethal acute chest sydrome. British Journal of Haematology. 2018; 182(2): 271-275. Charrin E, Dube JJ, Connes P, Pialous V, Ghos S, Faes C, Ofori-Acquah SF, Martin C. Moderate exercise training decreases inflammation in transgenic sickle cell mice. Blood Cells, Molecules and Disease. 2018; 69: 45-52. Walker AL, Ofori-Acquah SF. Sustained enhancement of OCTN1 transporter expression in association with hydroxyurea induced v-globin expression in erythroid progenitors. Experimental Hematology. 2017; 45: 69-73. Makani J, Ofori-Acquah SF, tluway F, Mulder N, Wonkam A. Sickle Cell Disease: tipping the balance of genomic research to catalyse discoveries in Africa. Lancet. 2017; 389(10087): 2355-2358. Charrin E, Ofori-Acquah SF, Nader E, Skinner S, Connes P, Pialous V, Joly P, Martin C. Inflammatory and oxidative stress phenotypes in transgenic sickle cell mice. Blood Cells, Molecules and Disease. 2016; 62: 13-21. Lei J, Benson B, Tran H, Ofori-Acquah SF, Gupta. Comparative Analysis of Pain Behaviours in Humanized Mouse Models of Sickle Cell Anemia. PLoS One. 2016; 11(8): e0160608. Mulder N, Nembaware V, Adekile A, Anie K, Inusa B, Brown B, Campbell A, Chinenere F, Cuda-Llyoka C, Kamga KK, Knight-Madden J, Lopez-Sall P, Mbiyavanga M, Munube D, Nirenberg D, Nnodu O, Ofori-Acquah SF, Ohene-Frempong K, Opap KB, Panji S. Proceedings of a Sickle Cell Disease Ontology Workshop - Towards the First Comprehensive Ontology for Sickle Cell Disease. Applied and Translational Genomics. 2016; 9: 23-9. Ghosh S, Ihunnah CA, Hazra R, Walker AL, Hansen JM, Archer DR, Owusu-Ansah AT, Ofori-Acquah SF. Nonhematopoietic Nrf2 dominantly impedes adult progression of sickle cell anemia in mice. Journal for Clinical Investigation. 2016; 1(4). Tan F, Ghosh S, Mosunjac M, Manci E, Ofori-Acquah SF. Original Research: Diametric effects of hypoxia on pathophysiology of sickle cell disease in murine model. Experimental Biology and Medicine. 2016; 241(7): 766-71.